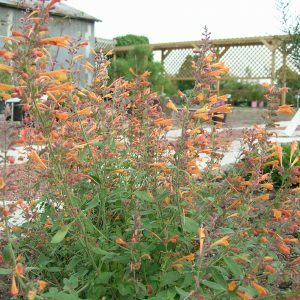 The name Agastache is from Greek agan and stachys meaning much like an ear of wheat referring to the shape of the flower spike. Anise hyssop leaves were used by American Indians of the Missouri River region to make tea and as a sweetener in cooking. The Cheyenne used it to relieve chest pain due to coughing or to a dispirited heart. Listed hyssop as an aromatic herb in McMahon’s 1805 book. 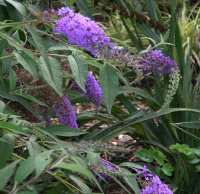 Awards: 1997 Plant Select award recipient. First collected by Meriwether Lewis. Introduced to gardens by Edward Greene before 1915. These flower for two months or more. All plants are perennials. If planted together in one garden these make a 21 square foot garden. 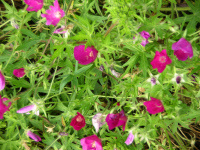 *Most of these plants get wider over time by spreading roots or by self-seeding . 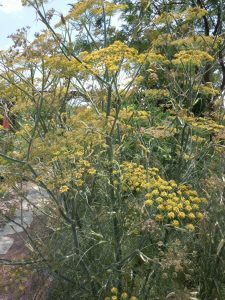 Yellow blooms on umbels in late spring into summer, features feathery, compound, aromatic purple leaves with needle-like segments. Wildlife Value: attracts bees and birds. Nectar plant for Swallowtail butterflies. Published in American Midland Naturalist 1945. 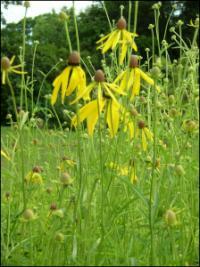 Skirt of drooping, sunny, thin petals surround erect brown cone on this flower, June-August. Flower is fragrant, smells of anise. Wildlife Value: Attracts butterflies. Birds eat seeds. Pinnata means “feathery” in Latin referring to the thin petals of the flower. 1st Americans cured toothaches with the root & made tea from the cone and leaves. Collected by French explorer Michaux on the prairies of Illinois in 1795. 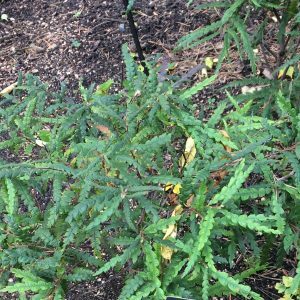 Grown for it’s fern like leaves, this small shrub flowers in spring with insignificant yellow flowers followed by brown nutlets. Foliage is fragrant when crushed. Care: sun to part shade in moist, well-drained to well-drained soil. Prefers acidic, but will grow in other types of soil as well. Drought and salt tolerant. Wildlife Value: Attracts bees, butterflies, & birds. Larval host plant for a wide variety of moths, including the Io moth & several Sphinx moth species, and the Anise Swallowtail butterfly. Deer resistant. Nitrogen fixer. Genus name honors Henry Compton (1632-1713), Bishop of London and patron of botany. Peregrina means exotic or immigrant. Many Native Americans (Algonquin, Cherokee, Chippewa, Delaware, Menominee, Delaware, Potawatomi) used this plant for a wide variety of purposes: Crushed leaves inhaled for headache. Leaf infusions for: round worms, fevers, beverage, blood purifier, blisters, clear mucus from lungs, bladder inflammation, rash from poison ivy, swelling, flux, stomach cramps, itch. Fragrance leaves- burned or crushed for incense in ceremony, perfume, Decoction – childbirth, tonic, Other: sprinkle on medicine to poison enemy, prevent blueberries from spoiling, leaves in fire to make smudge to ward off mosquitoes.